The development of breast cancer-related lymphedema (BCRL) is a troublesome consequence of breast cancer treatment. The onset often occurs after lymph node biopsy and radiation affecting the armpit area. BCRL is characterized by the accumulation of fluid in the interstitial tissues in the arm, shoulder, neck or torso. It may be associated with varying levels of pain and discomfort, as well as heaviness and weakness in the arm. There is also a heighted susceptibility to infection in the associated arm. Breast cancer-related lymphedema can result in decreased function and impact self-care abilities, and also have a negative influence on overall quality of life. Prior advice to women struggling with breast cancer-related lymphedema involved minimizing stress to the affected arm, which may lead to physical activity avoidance. However, more recent research is demonstrating that carefully progressed strength training routines do not increase the risk or severity of BCRL. In addition, in breast cancer survivors at risk for lymphedema, modest weight lifting does not increase the risk of developing lymphedema. There are other positive effects of strength training with this population including increased muscle strength, decreased pain, and improved quality of life. It should be noted, however, that caution should be taken when initiating a weight training program. Lymphedema should be stable prior to starting weight lifting. Compression garments should be worn on the involved upper extremity during upper body activities. An appropriate program will begin in a supervised setting, at low resistance levels. Resistance exercises performed with dumbbells should be started with 1 to 3lbs and progressed only if there are no changes in lymphedema symptoms after 2-4 sessions. Women should be aware of what to look for and how to respond if there is a change in swelling or symptoms. The involved arm should be closely monitored for increases in size, heaviness, stiffness, fatigue, or compromised mobility. Any exacerbation in symptoms should be addressed with a certified lymphedema therapist. As with any type of exercise routine, consistency is key. An ideal program would involve 2 days per week of upper and lower body weight lifting. This should be performed on a regular basis, with care taken to minimize breaks or irregularity. It has been hypothesized that irregular attendance could lead to injury and/or exacerbation of lymphedema symptoms. 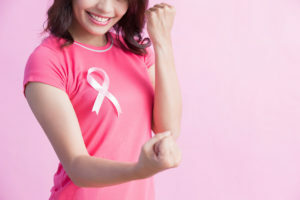 If you are interested in beginning an exercise program, “Strength and Courage” offers exercises for breast cancer survivors at http://www.strengthandcourage.net/dvd/overview.aspx You can also speak with a physical therapist about developing an appropriate weight training routine in order to gain strength and function. Schmitz K, Ahmed R, Troxel A, et al. Weight Lifting in women with breast-cancer related lymphedema. N Eng J Med. 2009;361(7):664-673. Schmitz K, Troxel A, Cheville A, et al. 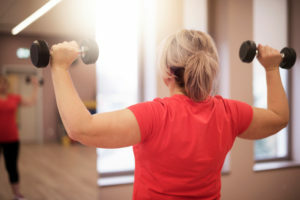 Physical activity and lymphedema (the PAL trial): assessing the safety of progressive strength training in breast cancer survivors. Contemp Clin Trials. 2009;30:233-245.